Once upon a time you could only find the Bibbidi Bobbidi Boutique on land in Walt Disney World and Disneyland. However with recent enhancements to some of the Disney fleet, your princesses and pirates can get makeovers on all Disney Cruise Line ships. 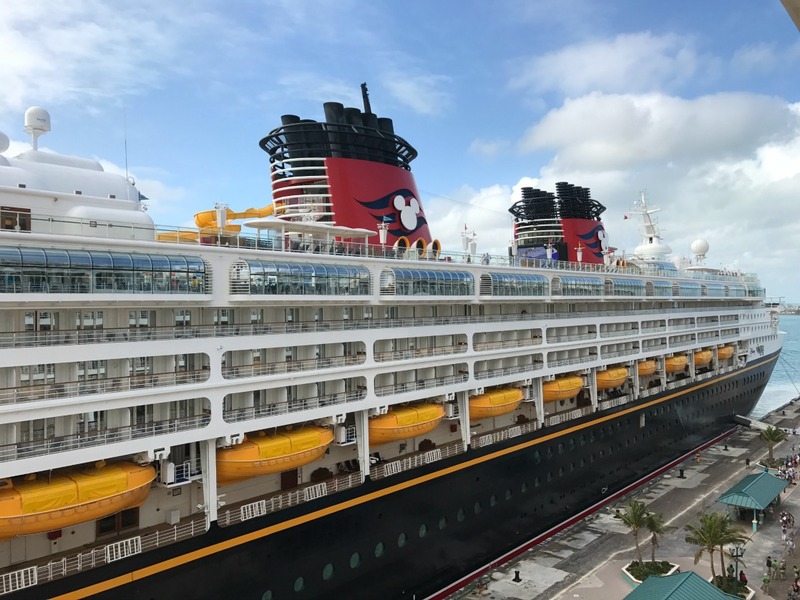 Our Latina Traveling Mom recently set sail on the Disney Dream where two of her daughters were magically transformed into princesses on the high seas. The next time you’re on Disney Cruise Line and you have princesses, the Bibbidi Bobbidi Boutique is a little girl’s dream come true. That’s only if your little girl loves pink, glitter, sparkles, make-up, and nail polish. Two of my daughters fit the bill and begged to have a princess makeover. Since that’s what they chose as their only souvenir, I obliged. 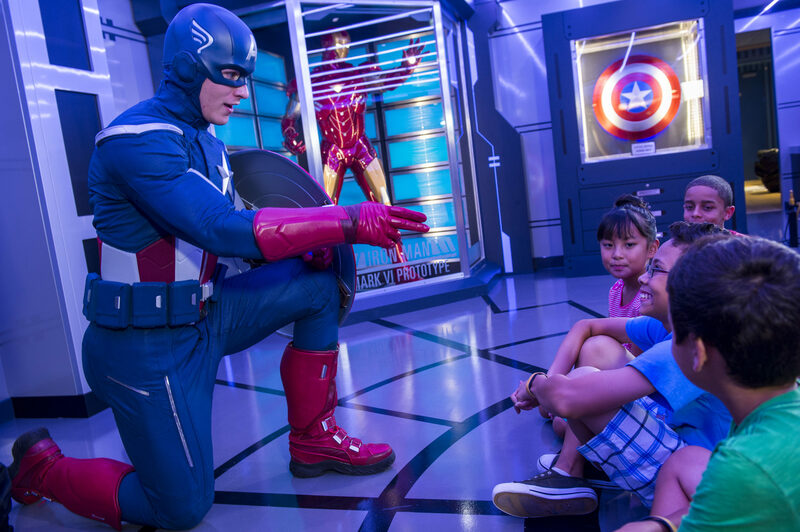 Read on for tips for getting the most out of your Bibbidi Bobbidi Boutique experience. Book an appointment in advance online through your Disney Cruise Line account. We made a last-minute reservation less than 30 days in advance for our cruise, so the Bibbidi Bobbidi Boutique was not high on my priority list at the time. Luckily when we got on the ship and we figured out our schedule, I called from our room, and they were able to fit us in. You can also walk in and see if there’s availability, but it was very convenient just to call. We actually made the reservation the second to last day on our cruise. The other days the girls wanted to swim, so Bibbidi Bobbidi Boutique hairstyles and the pool don’t mix. I would guess one of the most popular days would be on Pirate Night (if your cruise has a Pirate Night). That night you can choose a Pirate’s League makeover for boys and girls instead of the traditional packages. There are choices galore! The most common packages are the Crown Package and the Castle Package. 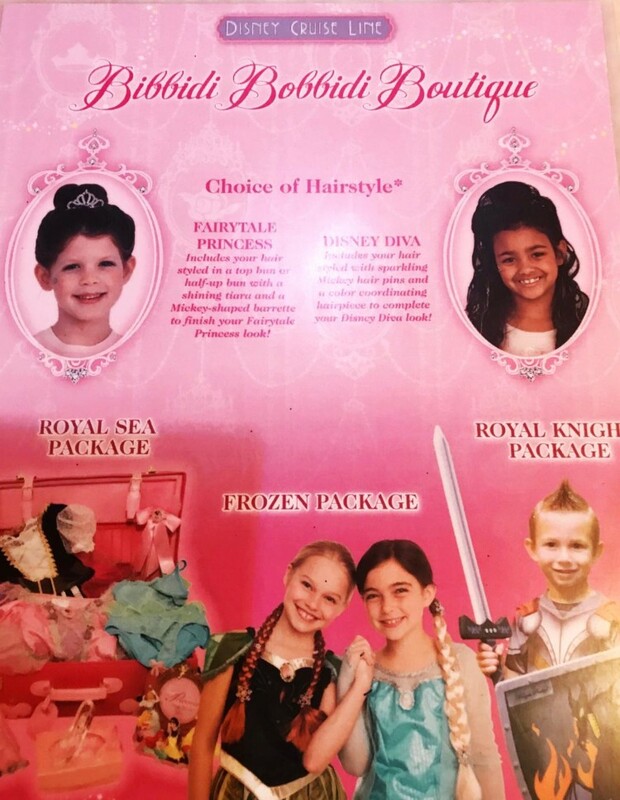 The Crown Package is $64.95 and includes a choice of hairstyle, plus shimmering makeup, face gem, nail polish, Princess tote and Princess Sash. The Castle Package is $199.95 and includes everything in the Crown Package, plus a choice of Disney Princess costume with coordinating wand and crown accessories. There is also a Disney Frozen Package ($164.95) that includes your choice of the Anna hairstyling with Anna costume or Elsa hairstyling with Elsa costume, plus shimmering makeup, face gem, nail polish, a princess sash, a princess tote and huggable Olaf plush. The Under the Sea Package ($99.95) includes a 2-piece swimsuit, a “mermaid tail” wrap, vibrant sunblock application, a hair clip, necklace and nail polish. For the boys, consider a Royal Knight Package ($19.95) with hair gel and colorful confetti, plus a mighty sword and shield, or a Captain’s Package ($119.95) that includes Captain costume, Captain Hat, and Captain Mickey plush. 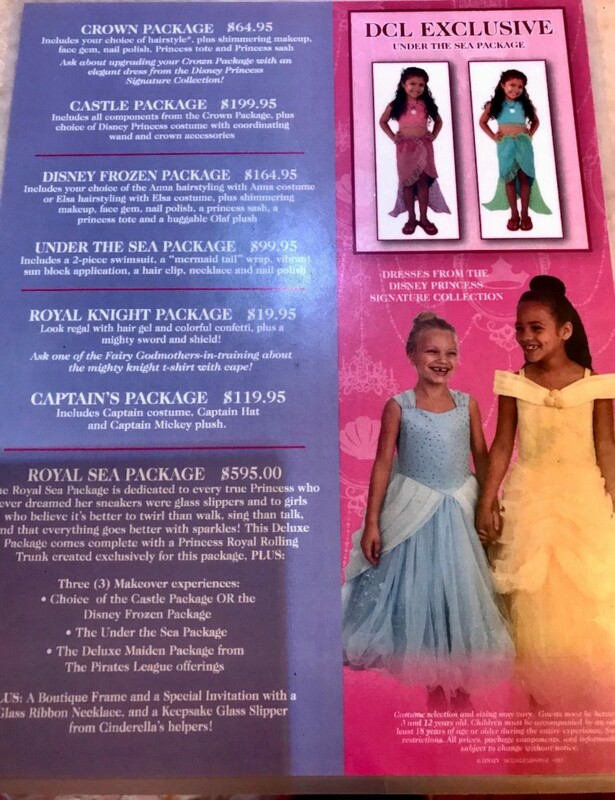 And if your princess wants to live and breathe the Bibbidi Bobbidi Boutique during your Disney Cruise, you can opt for the Royal Sea Package for $595.00. It includes 3 makeover experiences plus glass slippers, and hopefully a trunkful of Disney stock. Just kidding about the Disney stock. Pero, that’s a lot of money. My daughters would be in heaven, but again, that’s a lot of money. On the Disney Dream, go to Deck 5 Midship and you’ll find the Bibbidi Bobbidi Boutique. We also visited on the Disney Magic, and it’s located on Deck 10. There’s a whole lot of pink and a whole lot of pixie dust! Of course, my hijas loved it! Check in at the front and choose your hairstyle. Fairytale Princess which is the traditional bun and tiara or Disney Diva, which includes sparkling Mickey pins and a coordinating hairpiece. The hairstyles have changed a bit since my daughters got their makeovers. The Fairytale Princess style is no longer such a tight bun. Your Fairy Godmother-in-Training escorts your princess to her chair and begins the chosen hairstyle. Both of my girls chose the Fairytale Princess. It used to be a lot of pulling to get your hair into that smooth bun, so I’m glad they did relax it some. The Fairy Godmother-in-Training was very nice and asked if she wanted a different hairstyle. My daughter declined and wanted that tiara! After that hiccup, she was fine. My daughters’ favorite parts: getting their nails painted and having their makeup done. They get their choice of eyeshadow and lip gloss. The unused makeup goes home as a gift! Next is the pixie dust! My girls love their glitter, so they asked for double pixie dust. They use a shield to cover the girls’ faces and then sprinkle glitter all over their heads. It’s pretty much a sueño hecho realidad (dream come true)! Last is the big reveal! They don’t let the girls see their look until the very end when they turn the chair and ta-da!! Is Bibbidi Bobbidi Boutique on Disney Cruise Line Worth the Price? We always choose the Crown Package (on land or sea) and bring our own Princess dress or whatever outfit the girls want to wear. It’s definitely a fun experience, and my girly girls adore it! The ones who aren’t so into hair and makeup can do without and would rather have different souvenirs. The whole experience takes about 45 minutes, and an adult must stay during the appointment. Considering a manicure for girls on the ship is $45 at the spa, then it’s not a bad price. I do wish there were more hairstyles available. You can stop by the Bibbidi Bobbidi Boutique Disney Cruise Line for touch-ups for free. It’s also fun for pictures with Disney characters on the ship. If the Bibbidi Bobbidi Boutique is in your budget, I would definitely recommend the experience! 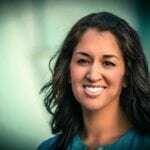 Tania Lamb is a Latina mom of 5 girls, ages tweens to preschooler. Dance parties, lip sync battles, the Avengers, and general tomfoolery are what bond this familia together. Tania lived in Ecuador and Russia, is proud of her Bolivian heritage, and loves to travel with and without her clan. She was a Disney Parks Moms Panelist, is a Role Mother for Another Mother Runner, and shares her stories on her blog, Lola Lambchops. Tania is happy to go on a run with you as long as there are empanadas waiting at the finish. Over the years of sailing with DCL, I’ve learned how to coordinate our BBB visit with the Princess Gathering. We usually choose the Castle Package, and all that finery is put to good use when we can meet the princesses on the ship on the same day. I book Princess Gathering tickets first and then book a BBB appointment that is at least 2 hours earlier that the ticket time. My daughter is getting older and doesn’t always want to wear her costume all day, but she still loves meeting the princesses dressed in her finest! My concerns is about the hair styling. What options are there for children of color who cannot have their hair put into these styles? (Or mom doesnt want others using glitter and such in their hair!) My daughter would love the experience but how can we do so without the hair styling? When we went to the one in Disney (not the cruise) My niece was able to do all except the hair style.. so mostly nails and make up. There wasn’t much price difference but it is possible.